From the back of the stage to the front, Andrea Belding-Elson, Joshua Riehl and Chayla Hope of Seafair perform at Brite Winter on the West Bank of The Flats in Cleveland. Photo Robert Muller / Brite Winter. 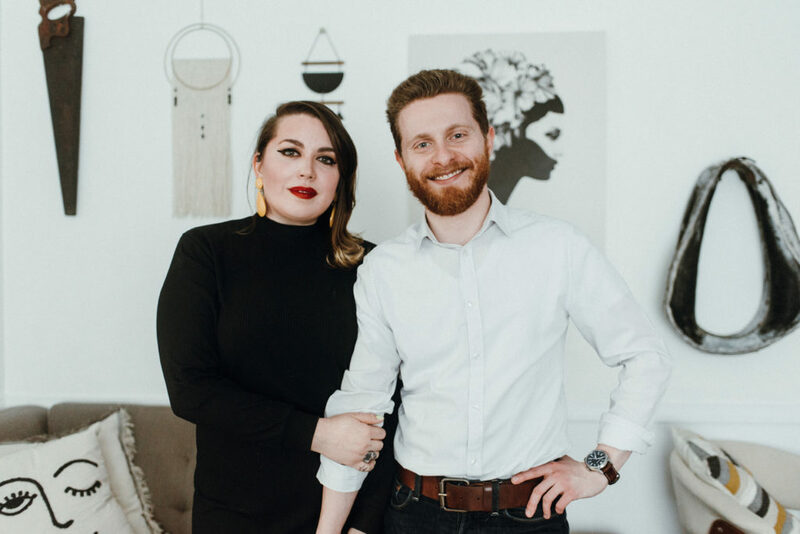 Weaving original rock ’n’ roll music into the community fabric is a key goal of partners Chayla Hope and Teddy Eisenberg, respectively lead singer of Seafair and the group’s manager. Performing original rock is critical to Sean Benjamin, a singer-songwriter from Lakewood. And helping spread word of the area’s diverse rock scene matters to Kathy Blackman of Cleveland Heights, who has owned the Grog Shop in that inner-ring suburb for more than 25 years. Hope, 31, is the leader of Seafair, an eclectic, six-piece group of great range and richness. Eisenberg, 24, manages Seafair and, with Hope and concert promoter Jeanette Sangston, runs Sixth City Sounds, a nonprofit dedicated to furthering the Cleveland rock scene.eaving original rock ’n’ roll music into the community fabric is a key goal of partners Chayla Hope and Teddy Eisenberg, respectively lead singer of Seafair and the group’s manager. 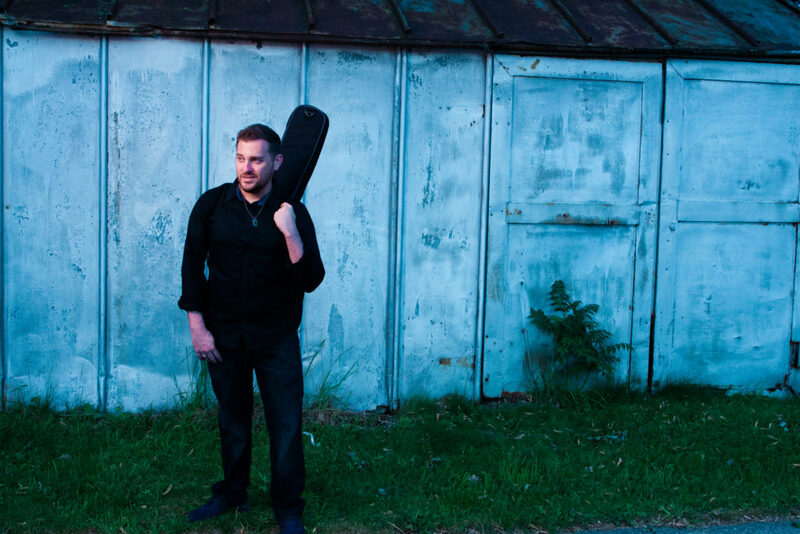 Performing original rock is critical to Sean Benjamin, a singer-songwriter from Lakewood. And helping spread word of the area’s diverse rock scene matters to Kathy Blackman of Cleveland Heights, who has owned the Grog Shop in that inner-ring suburb for more than 25 years. Hope’s daytime job is vinyl press operator at Gotta Groove Records in downtown Cleveland. Eisenberg is manager of business operations for EZ ERISA Plan, a sister company to the Cleveland law firm Zimon LLC. Both attend Temple Israel Ner Tamid in Mayfield Heights, where his father, Matthew, is the rabbi. Blackman attends Anshe Chesed Fairmount Temple in Beachwood. All operate in the shadow of Live Nation, the area’s largest concert promoter, where Michael Belkin is senior vice president, carrying on the tradition of his father, Mike, and his uncle, Jules. Mike and Jules Belkin founded Belkin Productions, an ancestor of Live Nation, in the mid-’60s. Belkin Productions was the premier concert promoter in Cleveland and the Midwest until its sale in 2001. A favorite at Brite Winter, where it co-headlined in February, Seafair was founded in 2012. Eisenberg, who manages the band “on a daily basis,” says Seafair hopes to have the new album, or at least another single, out by fall. 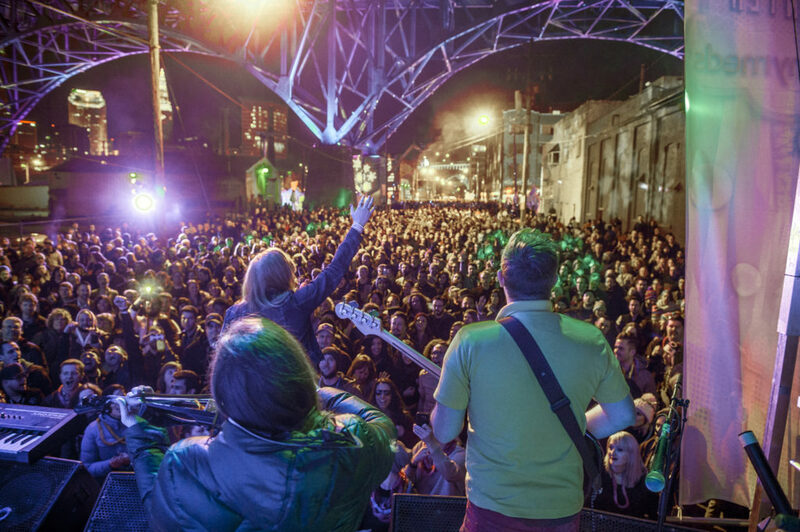 Sixth City aims to be an advocacy-oriented clearing house for local musicians, Eisenberg says. Chayla Hope and Teddy Eisenberg, two-thirds of the team behind Sixth City Sounds. Photo Suzuran Photography. To answer such questions, Sixth City presents Mixing Sessions, occasional gatherings where musicians, venue owners and music businesspeople can network and discuss issues; free pop-up concerts like ones last summer that were part of the Regional Transit Authority’s Summer Jam Series; partnerships with institutions like RTA and Destination Cleveland designed to spotlight local music in more events and spaces throughout the city; and CLE Music Shelves, displays of CDs by local musicians in local coffee shops, clothing stores and breweries frequented by people who may no longer go to the region’s few remaining music stores. 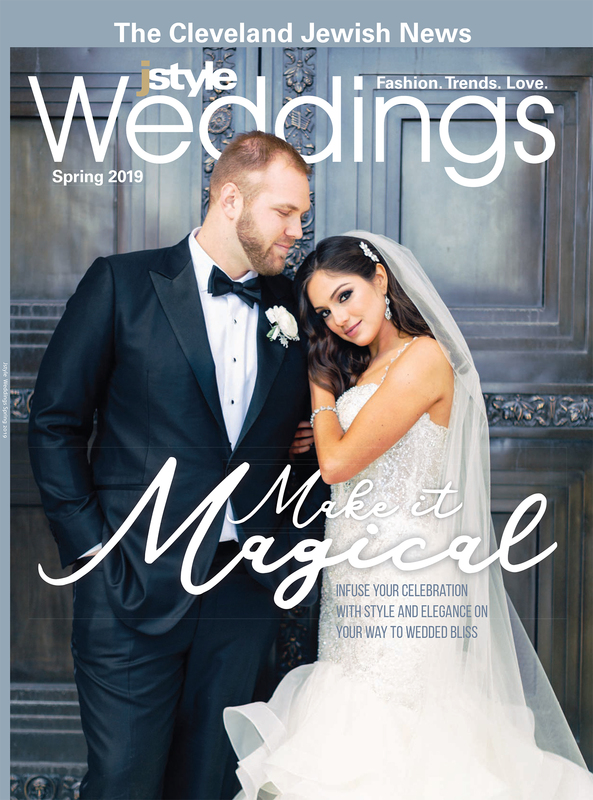 Among recent outlets: CLE Urban Winery in Cleveland Heights, Coquette Patisserie in Cleveland’s University Circle neighborhood, Nature’s Oasis in Lakewood, Wadsworth Brewing Company in Wadsworth and Whiskey Grade in Cleveland’s Ohio City neighborhood. “We wanted to be in locations where people are not used to seeing local music,” he says. “I’m an acoustic singer-songwriter, very influenced by a lot of things,” says Benjamin, a cat lover who cites touchstones such as ’90s alternative rock, soul singers Wilson Pickett and Percy Sledge, neo-soul groove-master G. Love & Special Sauce, and low-impact troubadours Damien Rice and David Gray. Benjamin, who in January released “Elaborate,” his first single in years, sells most of his music through online channels like iTunes and Amazon, pressing limited runs of his CDs to sell at shows. Musician Sean Benjamin. Photo Sean Benjamin. Among his favorite venues: House of Blues in downtown Cleveland and The Brothers Lounge at West 116th Street and Detroit Avenue, also in Cleveland. Benjamin credits Sixth City for “trying to be that cement that holds this all together, that rising tide that lifts all boats. There are people out there really trying to help the community, so there is a scene, certainly for the musicians. Kathy Blackman sees herself as a facilitator, a go-between. Not only does she help local bands by placing them on bills at The Grog Shop, she recommends them to promoters in other cities and occasionally gets them spots on national bills presented by Live Nation at House of Blues and elsewhere. 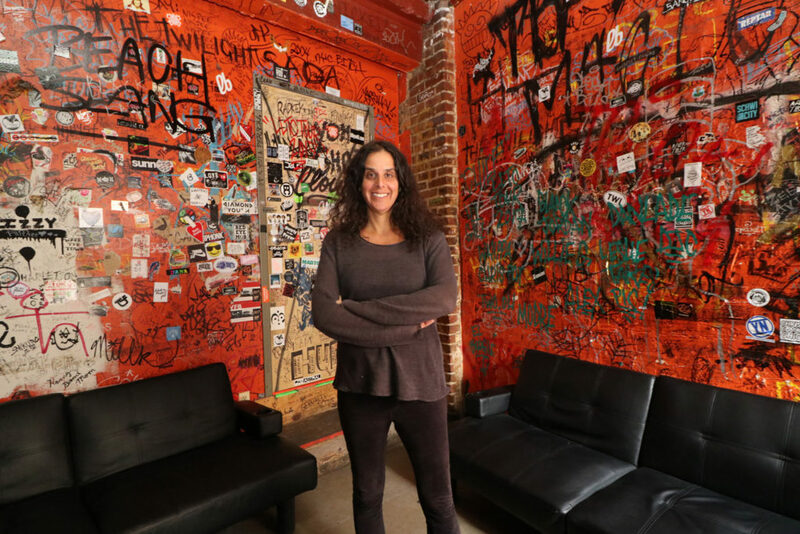 Grog Shop owner Kathy Blackman inside the venue’s backstage band room. Photo by Michael C. Butz. Blackman does her best to keep up with a constantly changing scene and is eager for the next breakout band. Blackman also notes there are other industries in the area associated with rock, like Akron-based guitar pedal manufacturer Earthquaker Devices, and Cleveland’s Gotta Groove Records “does a lot of cool stuff.” Such behind-the-scenes operations also are integral to the region’s musical fabric. So are higher-profile organizations like the Rock & Roll Hall of Fame, which just last week staged its 2018 induction ceremonies in Cleveland and has featured local bands in its summer concerts. There’s also Live Nation, which Blackman calls a “gatekeeper” for local bands it occasionally books into places like House of Blues and Jacobs Pavilion at Nautica.